This week it’s hot and humid in Conakry, capital of the west African Republic of Guinea. It will hit 30 degrees in the day; the humidity will be 100%. Until Saturday, when the much-postponed, much-rigged parliamentary elections will be held, there will be occasional thunderstorms, sunny spells, and an inch of rain per day. But there’s not enough water to douse the allegations that the President of Guinea, Alpha Conde, took payoffs through go-betweens to rig the presidential elections of June and November 2010; put up Guinea’s mining concessions for a fresh round of corrupt awards; and let Rusal off the hook of a billion-dollar compensation order by the Guinean Government and local courts. The allegations come from Conde’s former advisor and arranger, Samuel (Sami) Mebiame. The principal Russian with an alleged finger in Conde’s pocket is, surprise! Oleg Deripaska, chief executive and the trustee shareholder for the state aluminium monopoly, United Company Rusal. He’s in good company – President Jacob Zuma of South Africa belongs to another of the alleged fingers in Conde’s pocket. So too digits allegedly belonging to George Soros and Tony Blair, advisors to Conde for the advancement of Guinean democracy and, natch! of transparency in the award of Guinea’s lucrative mining concessions. Mebiame, in his 40s, is the son of a former prime minister of Gabon, Leon Mebiame. Sami Mebiame is reported to have homes in France and South Africa. His role as Conde’s advisor and go-between surfaced when his signature was found on behalf of the Guinean Government on the now notorious $25 million loan contract between the government in Conakry and Palladino Capital, a South African front. That affair became public knowledge a year ago. “Sam with a Plan”, London’s Africa Confidential called Mebiame in its July 2012 investigation. The Palladino affair was an African version of the loans-for-shares scheme devised by Russians in the mid-1990s to steal the country’s most valuable resource concessions. The Palladino principals have professed their innocence; the Guinean Government has returned the loan money. But according to Mebiame, parts of the corrupt agreements he witnessed with President Conde continue in effect. To those whom Mebiame has taken into his confidence he appears to be blowing the whistle on Conde because he’s disgruntled. That isn’t the full story. Last November, Mebiame asked the former mining minister in Guinea, Mahmoud Thiam, to meet him in Miami. A year earlier Mebiame had attempted to gather evidence to implicate Thiam in wrongdoing during his term in office between 2009 and 2011. Mebiame offered to pay for the purloining of Thiam’s files. At the time Conde was attempting to nullify concession agreements Thiam had negotiated so that he could redirect them to the Palladino group and others backed by Soros and Blair. A black campaign of allegations against Thiam has been running in The Economist of London, and in reports by the wittily titled Center for Public Integrity of Washington and the Stabile Center for Investigative Reporting in New York. Mebiame failed to find what he was looking for in Thiam’s files. His subsequent evidence has exposed much of this reporting to have been as rigged as one of Conde’s ballots. When Mebiame asked Thiam to meet him in a Miami restaurant last November, Thiam says he suspected a trap. He believed Mebiame might tape the meeting in order to gather admissions by Thiam which could then be handed over to Conde for continuing the campaign against the concession decisions Thiam had made. Mebiame, Thiam had been told, had participated with Conde in negotiations with Rusal which had been held in secret in Paris in 2011. For the story of Thiam versus Rusal, and vice versa, read the backfile. Last November Thiam also suspected — he now says — that Mebiame had been betrayed by Conde and might be seeking to air his evidence publicly, and get his revenge against the President. One of the most important of Conde’s decisions, in which Mebiame was independently known to have been involved, was the outcome of the negotiations Rio Tinto had held with Conde over the fate of Simandou. One of the largest undeveloped iron-ore deposits in the world, Rio Tinto had forfeited to the Guinean Government blocks 1 and 2 of Simandou, which Beny Steinmetz and Vale had acquired in Rio Tinto’s place. Conde then came under pressure to reduce Rio Tinto’s obligations for blocks 3 and 4, and cancel the Steinmetz deal. Miami has become famous in Guinean circles for entrapment in cases of bribery for mining concessions. In March and April of this year, according to the US Federal Bureau of Investigation (FBI), US agents secretly tapped telephones and taped hotel meetings in order to build a corruption case against one of Steinmetz’s agents. Here’s that record. Four months before, also in Miami but apparently without the FBI’s knowledge, Mebiame met Thiam for more than three and half hours. They spoke in French. The only audible English is the mojito, coffee, buffet, and chopstick orders exchanged with the hotel waiter. Two excerpts from the Mebiame-Thiam tapes have now appeared in the Guinea media. The first runs for 17 minutes 16 seconds, and appears to be the start of the conversation. The second excerpt, which was published on September 19, runs for 6 minutes 31 seconds. Thiam confirms the meeting with Mebiame, and the authenticity of the recording. He says that more than one recording appears to be in circulation, and that he has verified the tape excerpts played to him by reporters. The Guinean media report they have been unable to confirm this with Mebiame. A Guinean Government minister is reported as saying about the tapes: “we are in an electoral campaign inside the country. I cannot make any commentary on the sound recording whose contents I don’t know. Besides, I don’t even know Samuel Mebiane about whom you speak to me.” Supporters of Conde charge that Thiam rigged the conversations with a Camerounian friend, and that Mebiame’s is not the voice on the published tapes. The timing of the disclosures indicates an intention to rally the opposition to Conde in the last days of the controversial parliamentary election. Thiam is emphatic that he is not the source of the tapes which have been published, and that what he has heard so far has been played to him by others. The likely provenance is that Mebiame made a record of their meeting, and this has begun leaking. So far the excerpts of the recordings deal with the plotting between Conde and the South Africans. According to Thiam, later in their conversation Mebiane went into detail about his involvement in Conde’s negotiations with the Russians. Thiam he was told that Mebiame was present at talks with Rusal officials in Paris at which an agreement was struck to relieve Rusal of Guinean Government claims for up to a billion dollars in liabilities. A secret agreement was reported in August of that year. A subsequent meeting in Moscow in October of 2011 between Russian and Guinean officials appeared to confirm the deal. The South Africans then intervened, along with Soros and Blair, and the terms of the Paris deal which Mebiame alleges began to unravel. That is to say, the public terms of the deal. These were then stitched back together again in December 2012, although Rusal didn’t announce the terms which had been signed until March of 2013. According to Thiam, the publication of two excerpts of the Miami tapes is likely to be followed by further releases of the remaining three hours of conversation. 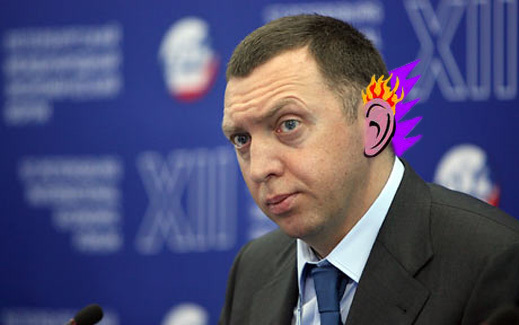 Mebiame’s allegations against Deripaska and Rusal have yet to appear. The Rusal report also discloses that the tax rate for its Guinean subsidiaries is “0%”.